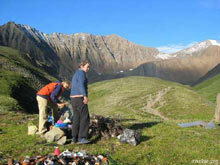 The best starting point to climb the Shumak pass is the village of Choito Gol. The distance between Choito Gol and the springs is about 50 kilometres. From Choito Gol the track goes north along forest roads. Soon the roads change to walking trails that lead you slowly uphill. After several kilometres, at a hight of 2200 m, you reach the tree line. Follow the valley along the river Jeche Ger. Another couple of km further the trail leaves the valley and leads you some more kilometres in northwestern direction to the rocks and scree of the Shumak pass. After some scrambling you reach the highest point of the tour  2768 m above sea-level. From here you have a magnificent view of the summits of the Tuchinski Glozi. Now the trail leads you downhill again, into the valley of the river Shumak. 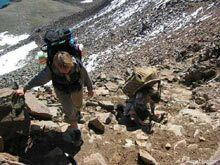 The first part of the descent is quite strenuous, because you have to walk lage parts over scree fields. The path becomes easier to walk shortly before you reach a small green lake and from there slowly descents until it meets the river Shumak. Here you can set up your tent or continue your walk for another 8 km to get to the Shumak springs. You can go the same way back or choose to walk a big loop along the river Kitoi to the Arshan pass. A smaller loop goes via Ara Chubuiti valley and Ara Chubuiti pass back to Choito Gol.